(Tucson, Arizona) --- The Large Binocular Telescope (LBT) partners in the U.S.A., Italy and Germany are pleased to announce that they chieved "First Light" on Oct. 12, 2005. These exceptional images were obtained with one of the telescope's two primary mirrors in place and are being released today on the World Wide Web, http://www.lbto.org. This milestone marks the dawn of a new era in observing the Universe. Upon completion the LBT will peer deeper into space than ever before, and with ten times the clarity of the Hubble Space Telescope. With unparalleled observational capability, astronomers will be able to view planets in distant solar systems, and detect and measure objects dating back to the beginning of time (14 billion years ago). Located on Mount Graham in southeastern Arizona, the $120 million (USD) LBT is a marvel of modern technology. It uses two massive 8.4-meter (27.6 foot) diameter primary mirrors mounted side-by-side to produce a collecting area equivalent to an 11.8-meter (39 foot) circular aperture. Furthermore, the interferometric combination of the light paths of the two primary mirrors will provide a resolution of a 22.8-meter telescope. The "honeycomb" structured primary mirrors are unique in that they are lighter in weight than conventional solid-glass mirrors. The second primary mirror was recently transported from the University of Arizona to Mount Graham and has been installed. By fall 2006, the LBT will be fully operational with both of its enormous eyes wide open. The LBT's first light images were taken on 12 October 2005. 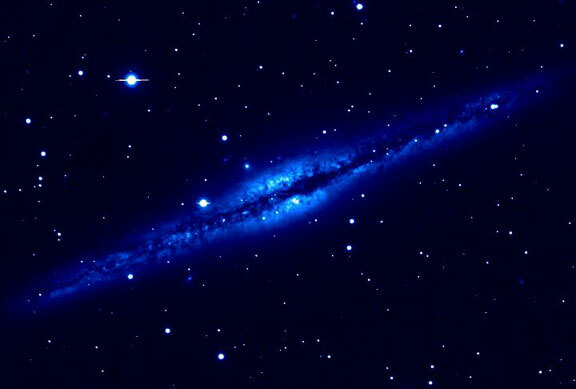 The target was an edge-on spiral galaxy (type Sb) in the constellation of Andromeda known as NGC891. This galaxy lies at a distance of 24 million light years. NGC891 is of particular interest because the galaxy-wide burst of star formation inferred from X-ray emission is stirring up the gas and dust in its disk, resulting in filaments of obscuring dust extending vertically for hundreds of light-years. The images were captured through a state-of-the-art camera known as the Large Binocular Camera (LBC), which is mounted high above the primary mirror at the telescope's prime focus. Designed by the Italian partners in the project, the LBC acts like a superb digital camera. Its large array of CCD detectors is fed by a sophisticated six-lens optical system. Scientists can obtain very deep images over a large field of view, which is important since the processes of star formation and faint galaxy evolution can be observed with unmatched efficiency. Peter A. Strittmatter, president of the LBT Corp., said, "This is a momentous occasion not only for the LBT partners but also for the international astronomical community. These first images far exceed our expectations and provide a glimpse of the unparalleled observational power the LBT will provide. We are extremely excited by the prospect that we can now observe the Universe from the earliest epochs of galaxy formation as well as provide major new capabilities for the study of exo-solar planets and the possibility of life outside our solar system." John P. Schaefer, chairman of the LBT Corp. Board of Directors and member of the Research Corporation Board of Directors said, "The LBT project is a remarkable scientific achievement made possible through an unprecedented spirit of international cooperation. The LBT has grown from an idea on paper to an international partnership of over 15 institutions from around the world contributing directly to its successful implementation. This achievement is a tribute to what can be done when great minds come together." First light is the culmination of nearly 20 years of work that began with conceptual designs. Detailed designs were completed in 1994 and construction began on Mount Graham in 1996. The telescope structure was built in Italy while the University of Arizona designed, cast, and polished the twin mirrors. The telescope was transported to Mt. Graham in 2002, and the first mirror arrived in 2003. This primary mirror was mounted and aligned in the telescope in 2004. In 2005, a thin coating of aluminum was applied making it highly reflective and ready for capturing images. John Hill, Technical Director of the LBT, said, "This has been a long and challenging process and would not have been possible without the support of an outstanding team of partner institutions. From construction of our unique telescope structure to the implementation of massive mirrors, every step has involved great minds using cutting-edge technology. The remarkable success of the LBT is a tribute to the creative efforts of our team members." University of Arizona (25 percent). The innovative telescope mirrors being used for the LBT were cast and polished at the University's Steward Observatory Mirror Laboratory. The Mirror Lab is a pioneer in developing giant, lightweight mirrors of unparalleled power for the new generation of optical and infrared telescopes. The twin mirrors were polished to an accuracy of 30 nanometers, or 3,000 times thinner than a human hair. Steward Observatory and NASA's Jet Propulsion Laboratory are building the "LBT Interferometer," an instrument that provides unprecedented imaging capability at infrared wavelengths. The University served as the lead for construction of the one-of-a-kind enclosure that houses the telescope. Scientists at Arizona State and Northern Arizona Universities will also share in the Arizona viewing time on the LBT. Instituto Nazionale di Astrofisica (INAF) (25 percent). The INAF includes all the Italian Observatories and Astronomical Research Institutes. A consortium of Italian astronomical observatories, led initially by the Arcetri Astrophysical Observatory in Florence, and now by the INAF, has been involved in the project since its inception. The Italian partners were responsible for the detailed design and fabrication of the major structural elements of the telescope, including the cells that hold the telescope's twin primary mirrors. The structural parts were fabricated, pre-assembled and tested at the Ansaldo-Camozzi steel works in Milan, one of Italy's long-established steel fabrication companies. The telescope was then disassembled, shipped by freighter to the U.S.A. and transported overland to Mount Graham in 2002. The Italian partners also played a key role (along with Arizona) in developing and building the unique adaptive secondary mirror systems. They are also providing the Large Binocular Cameras, the first facility instruments for the LBT. LBT Beteiligungsgesellschaft (LBTB) (25 percent). The LBTB is a consortium of German institutes and observatories led by the Max Planck Institute for Astronomy in Heidelberg. The LBTB is developing the LUCIFER instruments for near infrared imaging and spectroscopy. LUCIFER 1 and 2 will operate in both "seeing" and diffraction-limited modes, the latter fully exploiting the capabilities of the adaptive secondary mirrors. The LBTB, in conjunction with the INAF is developing the LINC-NIRVANA instrument which will provide interferometric imaging capability at near infrared wavelengths. The PEPSI instrument, a high-resolution Echelle spectrograph, is also being developed by the Astrophysical Institute of Potsdam (AIP) and will allow astronomers to understand the structure and dynamics of the surface magnetic fields of solar-type stars. AIP will also deliver two Acquisition, Guiding, and Wavefront sensing units for the telescope. The LBTB has also made contributions to numerous aspects of the telescope including mirror supports and software. The Ohio State University (OSU) (12.5 percent). OSU has developed and refined the technology to deposit a whisper-thin coating of aluminum on the glass surface of the primary mirrors. The unique bell jar and vacuum system allows aluminization to take place while the mirrors are mounted in the telescope. OSU also has lead responsibility for the design and fabrication of the LBT's visible and ultraviolet light spectroscopy instrument, the Multi-Object Double Spectrograph (MODS), a low-to-medium resolution spectrograph and imager. Two full MODS spectrographs will be built with support from the Ohio Board of Regents, National Science Foundation and the University of Arizona. Research Corporation (12.5 percent). By becoming an LBT partner in 1992, the Research Corporation ensured that adequate funding was available to maintain project momentum at a critical stage in the development of the LBT. It has also facilitated the participation of OSU, the University of Notre Dame, the University of Minnesota and the University of Virginia in the project. The Research Corporation was established in 1912 to promote the advancement of science in the United States. The non-profit foundation has focused on supporting astronomy, chemistry and physics and has played key roles in several astronomical projects including Grote Reber's pioneering work in radio astronomy. Editor's Note - Further information and high resolution images can be found at http://www.lbto.org.